The dressing in this dish, a version of a Catalan recipe for romesco sauce, is not only delicious with asparagus but also over fish or on salads. First make the dressing. If using raw peppers, preheat the grill. Place the pepper on a baking sheet on the top shelf and grill on all sides until blackened. Remove from the oven, cover with clingfilm and leave to cool. Once cool, remove the clingfilm; pull out the stalk and seeds and peel off the black skin. Crush the garlic clove to a paste with a pinch of salt. Pulse the almonds in a food processor until finely ground, then add the roasted red pepper or piquillo peppers and garlic and pulse until smooth. Transfer to a bowl, stir in 5 tbsp oil and the paprika, followed by the vinegar and 4 tbsp water, adding a little more water if the dressing is too thick. Season. If the ends of the asparagus are woody, gently flex the thick end until the stem snaps off at its natural break, or peel. Bring a wide saucepan of salted water to the boil and add the asparagus; bring the water back to the boil with the lid on, then remove the lid. Boil for 2–3 minutes, depending on the stems’ thickness, until tender. Drain. Place in a bowl, pour over the remaining olive oil and the lemon juice and season. 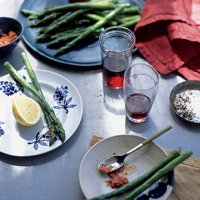 Arrange the asparagus on a large plate and serve with the almond and red pepper dressing.